Zalipie is a small village of about 800 inhabitants in the southeast of Poland. 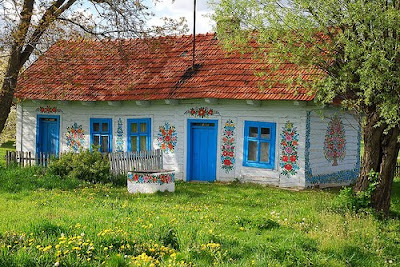 It is known as the painted village, because of the decorations one will find, not just on the interior and exterior of the houses, but also on trees, village pumps, street furniture and other objects in public space. Kind of a collective art environment? The tradition seems to have begun at the end of the 19th century. when ovens with chimneys became usual and it proved worthwhile to make paintings on the walls, which previously were smoke-affected. This story is related on the webpage of polish Skanseny.net, the site of a project that documents all open air (ethnographic and folkloric) museums in Poland. However, making decorations by women as such may have started earlier, in the second part of the 19th century, and (as Alice in her comment remarks) this may have "a lot to do with the political and social freedoms acquired by the villagers post the 1848 upheavals. (Like the right to marry in different county without obtaining permission of the landowner or some bureaucrat)". Anyhow, the custom of house decorating had settled in Zalipie. Its development was greatly influenced by Felicja Curylowa (1904-1974), who was born in Zalipie and worked and lived there. The above mentioned Skanseny website says she was a unique artist, "who would paint anything that she put her hand on". Up to now I could not trace information about any formal art training she might have enjoyed, so I guess that at the start of her career she stood in a folk art tradition. 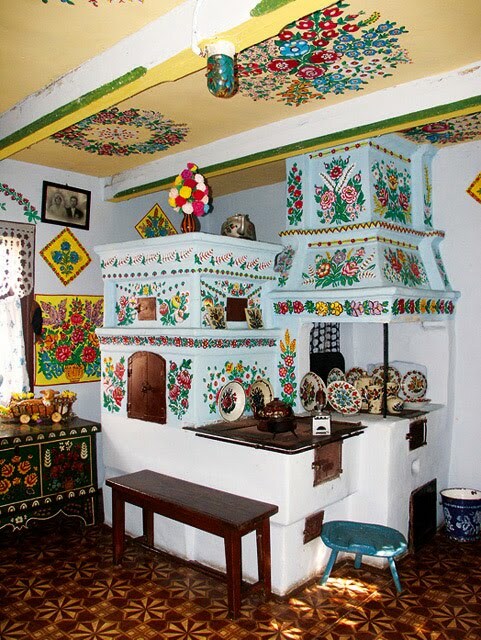 However, she had such a talent, that she was commissioned to do professional projects, like decorating the interior of a Cracov restaurant and making designs for the polish china producing company Wloclawek. Curylowa's enthusiasm was such that she gave courses to other women in Zalipie, who in turn were available as paid artists to decorate homes of other villagers. It's about emancipation. And business. But it's also about art of course. 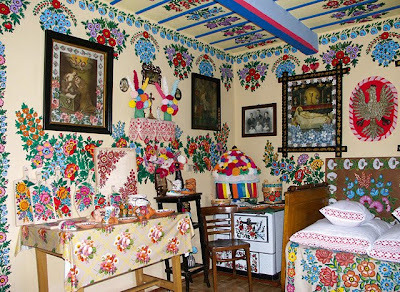 Because of Curylowa's influence the style and the color scheme as found in Zalipie are unique. Bouquets of flowers are the most common motive, represented in a wonderful combination of colors. So, Zalipie is not strictly about outsiders and outsider art environments. 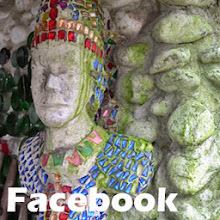 It's rather a mixture of folk art roots and professional and commercial elaboration. And intriguing it is, isn't it? Felicja Curylowa passed away in 1974. In 1978 the house where she lived, was bought by the Polish Cepelia Foundation, which seeks the preservation and promotion of folk art. In the same year it was transferred into the care of the regional museum in Tarnow. Currently the house can be visited as a museum. It's interior has been fully decorated by the artist. On the ceiling in the entrance she did her first creation, in 1914 when she was just at age ten. Hi Henk, I like this, it shows how much more people could do (but don't do often) to beautify the environment we live in... we could all do with a little more beauty in our lives... hope all is well in Holland ! Cheers ! I don't know where you get the idea that until 19 century the village houses in this area of Poland had no chimneys. By the 18 century no-chimney houses are found rarely in Malopolska (where Zalipie is). But Malopolska is unique that way, the no-chimney houses were gone by the 16 century in most regions of Poland. So you are mistaken by at least 100 years. Believe it or not, soot gathers in houses with chimneys. It has to do with the material being burned in the stoves - coal and wood. Thus the need to repaint the walls every spring (more accurately, to whitewash with hydrated lime - the effect was a bluish white color). Also, Felicja Curylowa was not an outsider. She was a trained artist, thou particularly talented, who designed drawings on variety of every day use items. For example, she worked for one of the most prominent pottery manufacturers in Poland - Wloclawek - and the pieces designed by her are highly collectible and can be very expensive. Just look at the pictures - these are not creations of some naive amateur. She was a skilled artist with perfect understanding of balance, perspective, and materials. She was also a social organizer and trained the women in the village (yep! suffrage! ), it was thru her efforts that the community hall was built, a place where they could gather and learn instead of apprenticing with one artist at a time. So the women also earned money the same way she did. By painting other people's houses. You seem to be under the impression that the villagers did it for themselves - no, no. They paid an artist to paint their houses. the reason in Zalipie so many women do it is because this particular village specialized in that form of profession thanks to Curylowa. Their homes are their showrooms. This is how they advertise. This is business. And these days it becomes a very well paid business. The style - these colorful bouquets of flowers, brilliant swags full of red and yellow and green - that's unique to Curylowa and this particular village (women she influenced and trained). Elsewhere, other artists made money by painting houses in different styles, none was so elaborate, in most places there would be 1 or 2 colors used. So this village stands out a lot. So while very intriguing story - this is not an example of an "outsider", per your definition. @ Alice, Hello! Thanks a lot for the comment. Wow, I guess I made quite a number of wrong interpretations, or let my phantasy work too fast. Not a good idea since I have the intention to be as correct as possible. I sure will have to rewrite this post completely or remove it because there is no connection with the world of "outsiders" I am dealing with. I will think about what to do, beacuse as you say, the story as such is intriguing, and deserves to be widely known.